Kazakhstan's Denis Kuzin edges out Olympic champion Mo Tae-bum for the 1,000 meter world title. 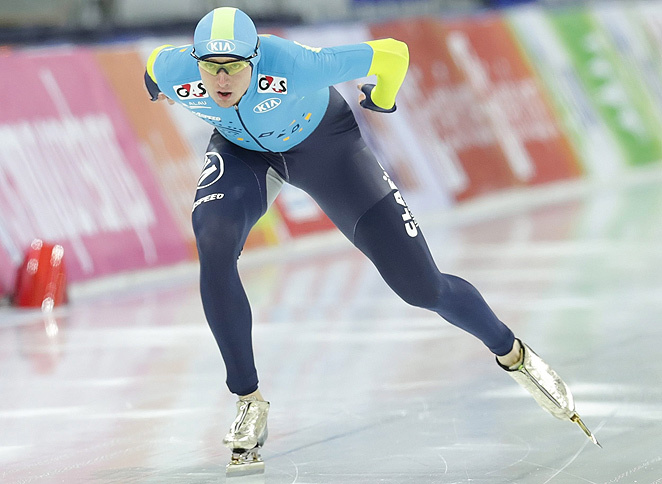 SOCHI, Russia (AP) -- Denis Kuzin has won his first major gold medal by taking the 1,000 meters at the speedskating world championships. Ireen Wust led a Dutch 1-2 finish in the women's 1,500 to claim her second gold medal in as many days. Kuzin of Kazakhstan finished in 1 minute, 9.14 seconds to edge out Olympic 500 champion Mo Tae-bum of South Korea by one-tenth of a second on Friday. Olympic 1,000 champ Shani Davis of the United States was third, six-hundredths of a second behind Mo in Sochi, Russia. Mo led at the 600-meter mark followed by Davis, the three-time world champ at the distance. But Kuzin blazed the fastest time of 26.6 seconds for the last 400 meters. The men's 5,000 is later Friday.